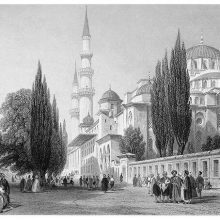 Mosque of Mahmoud II, at Tophana. 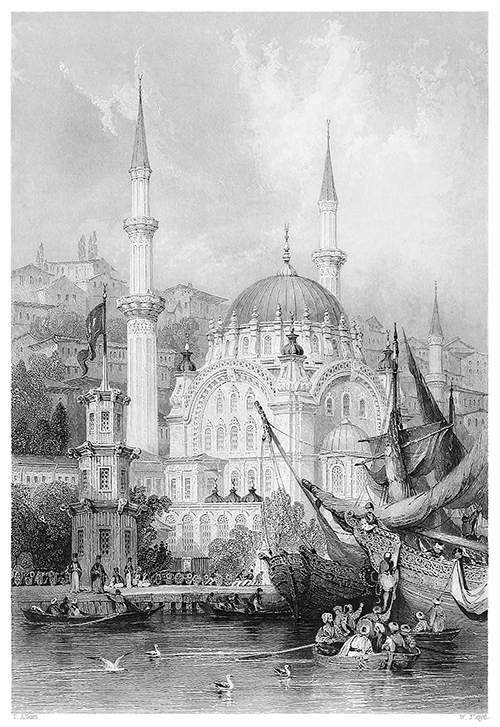 View of Nusretiye Mosque showing the Bosphorus in the foreground with a man boarding a ship from a rowboat. 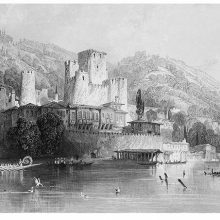 This beautiful but small imperial mosque of the reigning sultan, is situated not on a conspicuous eminence like those of his predecessors, but in the low alluvial ground on the shores of the Bosphorus, and on the water’s edge; but the beauty and finish of the edifice compensate for the defects of its site. All the skill of Oriental ornament is expended upon it. Rich lattice-work and taper spires of minarets highly gilded, glitter in the sun with a brilliancy and recency, as if they had been left just finished by the hands of the artisans; while painting and sculpture, in rich arabesque, give a peculiar elegance to the edifice.